A steamboat’s Tale, The Ruthven. Lying in the Trinity River at Parker’s Bluff, near Palestine, a cluster of remnants from an old sidewheeler steamboat serve as reminders of an era when cotton was king in much of East Texas. The A.S. Ruthven, weighing 144 tons and measuring 127 feet long, was built at Cincinnati, Ohio, in 1860 by a shipyard that turned out 288 steamboats. While most of the steamboats were placed in service on the Ohio, Mississippi and Missouri rivers, the Ruthven came to Texas, where she was placed in service hauling cotton down the Trinity River to Galveston. 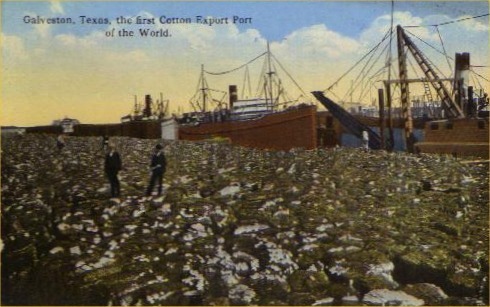 "Galveston, Texas, The First Cotton Export Port of the World"
But the craft had barely established herself on the Trinity when Texas seceded from the Union and the Ruthven’s owners leased her to the Texas Marine Department for use as a transport vessel. On the last day of 1861 she arrived at Galveston with a pair of artillery pieces, part of a shipment of fourteen for the defense of Galveston Island during the Civil War. In 1862 the Ruthven was running between Galveston and Buffalo Bayou and during October of that year, she was inoperable and had to be towed up Buffalo Bayou to escape the Union attack on Galveston. When the Civil War ended, the Ruthven went back to the Trinity River and, with the Texas cotton markers open again, she resumed hauling bales from East Texas to Galveston. But the Trinity was a fickle river. Some boats lingered too long upstream and found themselves trapped by low waters and were forced to wait until spring rains lifted the river. During the 1866-87 cotton season, the Ruthven made successful runs from East Texas to Galveston, delivering more than 2,200 bales. The Ruthven continued to serve customers on the Trinity through the l860s, but with growing competition from the railroads, the Ruthven was pulled from service. In the early 1870s George Anderson Wright of Palestine bought the old sidewheeler for $900, moved her to Parker’s Bluff, and began to dismantle parts of the vessel. 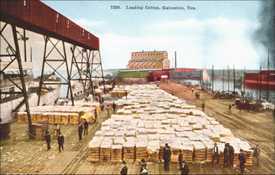 The steamboat’s boilers, engines and machinery were removed and sold to gins and sawmills in the area. The cabin was also removed and incorporated into the construction of a large Palestine home. The hull of the boat was left to deteriorate in the Trinity. In the 1970s an archeology team from the Texas Historical Commission traveled to Parker’s Bluff to determine if any of the Ruthven’s wreckage could be salvaged. While the boat’s hull had survived nearly 130 years in the river, the remains were in poor shape and had been scattered along the river. To the general public, the only visible reminder of the Ruthven is an anchor recovered by a group of young men in the l920s or 1930s.